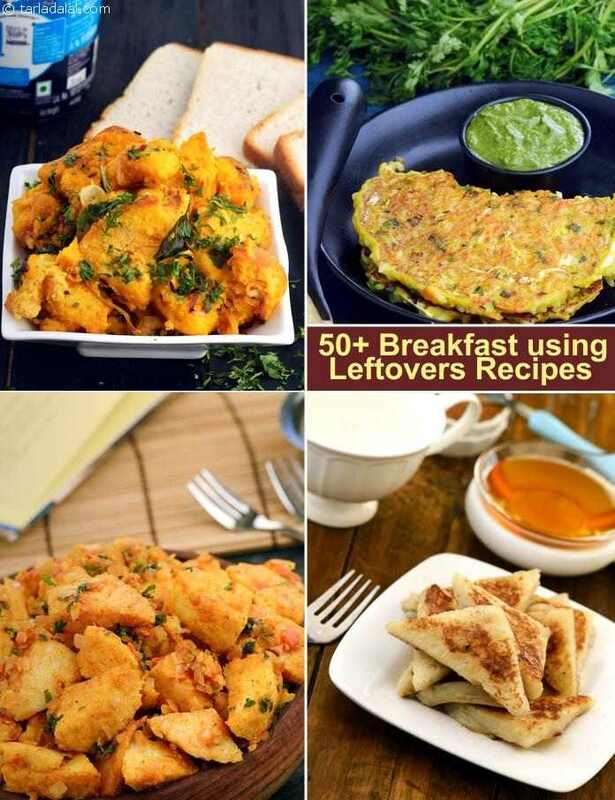 68 Breakfast Recipes using leftovers : Veg Leftover, Breakfast with Leftover Idlis, Bread, Paneer, Rice, Theplas. Nobody likes to waste food. Yet we cannot measure and cook our requirements exactly. Sometimes we feel like eating more and sometimes less, and often we end up with leftovers, which duly get stowed into the fridge and forgotten! Your leftovers will not go waste if you know how to use them up – and that too, in interesting ways. With a little creativity you can transform your leftovers into delicious breakfast dishes. It is best to use up your leftovers for the next day’s breakfast instead of keeping the stuff for longer and worrying about spoilage. Moreover, breakfast is the most important meal of the day and should never be skipped. For those of us who skip breakfast because we do not have time to prepare much in the morning, leftovers can actually be a boon, because they enable you to cook a delicious breakfast quickly, within minutes! Next time you have leftover bread, idlis or rotis, never throw them away. Leftover such as the following can comfortably be used to make breakfast. Theplas are tasty to have for dinner, but nobody wants to repeat them for breakfast even though they don’t spoil so quickly. So, make it into a scrumptious wrap! Even those who know how to use up their leftover bread or rotis are at a loss what to do with leftover khichdi. Oh, you will be surprised to know that these recipes made with leftover khichdi can be more interesting than the khichdi itself! How to use Leftover Idlis ? How to use leftover idli/ dosa/ batter? Leftover paneer is always there, as we often get tense about how to use it up quickly because it perishes quite fast once opened. So, if you have leftover paneer after making lunch or dinner, use it to make a tasty breakfast the next day! Leftover rice is perhaps one of the most usable of leftovers! It can easily be transformed into delicious foods that you can have for breakfast at home or in the dabba. We always feel guilty when food goes waste. However, with a little help from the recipes on our website you can avoid wastage at home, and use up any leftovers to make a wonderful breakfast. It will be a good change from the routine breakfasts that you usually have, and the whole family will enjoy it. Deep within, you are satisfied that potential waste has been avoided and the leftovers have been used up smartly. No waste, no haste! here is an easy and tasty dish that can be made in a jiffy with leftover rice. As a variation of this vagherala bhaat recipe, you can also add and sauté some onions after the tempering. Serve with fresh curds, to complement the spicy nature of this delicacy.